Though İskender kebap is a registered trademark of the famous Kebapçı İskender restaurant in Bursa, imitations are ubiquitous. In Istanbul, İskender kebab – a dish based on döner, strips of roasted lamb shaved off from a vertical spit – is almost as common as designer knock-offs in the Grand Bazaar. But unlike a $20 Dolce & Gabbana track suit with dubious stitchwork, the “pirated” İskender kebab over at Kasap Osman’s in the Sirkeci neighborhood is most certainly the real thing, if not better. The restaurant is located around the corner from the Sirkeci train station, on a side street that’s best described as an open-air food court for serious eaters. Restaurants offering kuru fasulye (Turkish-style baked beans), pide (or Turkish pizza) and other local specialties stand cheek by jowl on this crowded little street filled with outdoor tables. 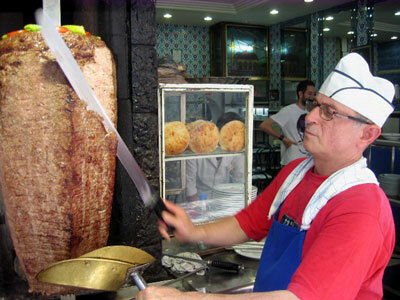 But something extra-special radiates from Kasap Osman (“Osman the Butcher” in Turkish), where, turning slowly on an upright spit, stands a blue-ribbon döner carefully watched by the usta. Döner, slices of lamb stacked like pancakes on a tall skewer and slowly turned before a vertical grill, is the most important factor in any İskender kebab. Though gas and electric grills are more common these days, we far prefer the smoky flavor imparted by the traditional cooking method employed by Kasap Osman, where charcoal is used to roast the döner. Naturally, the quality of the meat plays an important role as well, and who better to trust at the spit than Osman, who actually is a former butcher. Osman and his team also have experience working in their favor, having turned döner spit for a loyal, hungry audience of local shopkeepers and office workers everyday for the last 25 years from the same corner on Hocapaşa. Timed to coincide with the lunch hour rush, at around noon the usta starts shaving off the first long ribbons of succulent döner and collecting them in the pan in his other hand. The döner is then sent to the kitchen, where it becomes İskender kebab and other döner-based dishes. For İskender, our favorite, the cooked meat is laid over a bed of chopped flatbread in a clay dish and garnished with peppers and tomatoes and dressed with a thin tomato sauce. The dish is then quickly fired in the oven crisping the saucy bread on the bottom and softening the garnish. Finally, the whole dish is doused with butter browned in a skillet and a quick dollop of thick yogurt is added to one side. We can often hear our İskender sizzling on its way to the table. It’s quite logical that someone trademarked so noble a kebab and no surprise at all that the trademark is infringed upon everyday from Melbourne to Miami. But if you don’t have time for the official İskender kebab pilgrimage to Bursa, head over to Kasap Osman for the best genuine fake İskender in the city. Q: I read somewhere that Iskender kebab was named for Alexander the Great. Can you confirm this? It’s a nice story. “Iskender” is Alexander in Turkish, but the Alexander in this case appears to be the chef that created the dish in Bursa in the late 1800’s. A great chef, very likely, but not the Alexander the Great you’re thinking of. Sorry to hear about your bad experience. We’ve always found Kasap Osman to serve a very good version of Iskender. We’ll try to check it out again and see if things have slipped. This was my first taste of Iskender and it was love at first bite. Looking at the negative comment, I can only wonder, how much better can it get?? I’d love to find out, but it may be hard for me to try the dish anyplace else for a while, I am so fond of this lovely spot. A great, non-touristy lunch within a short walk of all of the touristy sites. I been twice already and, along with four American friends so far, thank you for the leading us to Kasap Osman. Unfortunately reading the update too late. Cold meat and very cold shrivelled chips. Stay away this place is no good. Iskender kebab was my favorite for years, and I’ve eaten it in many towns and cities across Turkey. Kesap Osman has become a must when we’re in Istanbul. The service seemed quite dry, but I was quite touched when the waiter, despite two years passing between our last couple of trips, remembered what we ordered and where we sat on our previous trip! They are very kind and I love the kebab.